The dreaded cone! (Also commonly referred to as the "lampshade" or the "radar dish.") Your veterinarian might give you this super stylish Elizabethan collar to protect your cat's recent surgery site from licking and chewing, and some cats need to wear one to prevent clawing and scratching at their face or to keep them from obsessively grooming themselves. If your vet suggests that you have your cat wear a cone during recovery, don't panic — you can do a few things to help them adjust and feel better about wearing it. Some cats acclimate to wearing a cone quickly and don't seem phased at all, while others freeze or have trouble figuring out how to move around like normal. The classic plastic cone changes how they hear noises and limits their line of vision, which can be stressful! Stress can affect your cat's recovery time. If your cat has an upcoming surgery scheduled, ask your veterinarian for a cone to use for desensitization a few weeks ahead of time, and take a few minutes throughout each day beforehand to help them acclimate to the cone and learn how to move about their daily routine with it on. Or if they need to start wearing one immediately, you can still work through the steps below to help introduce it in a positive way. If your cat is sensitive about change or very high energy, you can also introduce calming feline pheromones (Feliway) via a Comfort Zone diffuser to encourage relaxation. Start to increase the amount of time they keep the cone on. If at any time they freeze, try to back out of the cone, or paw at it to try and get it off, shorten the duration they wear it or go back to step one. Feed or treat them while wearing it, or if they are play motivated, engage in some play with their favorite cat toy. If your cat seems cautious about moving around with the cone on, encourage them to walk around using a treat, a wet food lure, or have them follow a toy. You can guide them up onto different perches to help them acclimate to the feel of the cone and how it affects their body awareness. Keep praising and rewarding with treats or play as your cat continues to acclimate to their cone — soon they'll feel comfortable going about their daily business with it on. Cats can get stuck more easily while wearing a cone, so block off areas where this might happen (under beds and other furniture), and monitor your cat's whereabouts while wearing a cone. Litter boxes can be difficult to enter and exit for your cat while wearing a cone — consider removing the lid of their litter box to make it easier on them. If you have a cat that usually goes outdoors, you should block off their outdoor access during recovery for proper healing and safety reasons, and never let them wear an Elizabethan collar outdoors. Note: Preventive Vet recommends that cats not be let outside without direct observation. This is for their own health and safety, as well as the health and safety of other animals in your neighborhood and even you and the other members of your home (cats can pick up zoonotic diseases that they can transfer to humans, or bring back fleas and other parasites). If this sounds like a good enough reason to transition your outdoor kitty to an indoor lifestyle, see how to keep an indoor kitty entertained and happy. Watch to see how your cat does with eating their food and drinking water while wearing their cone. If you cat has trouble eating or drinking while wearing the cone, try hand-feeding them or holding their dishes up for them to eat out of while they've got their cone on, or trim down the cone length (you just don't want to trim so much that they can then lick their stitches). For some cats you might need to remove the cone while they eat and drink, but you need to be around and monitor them closely to make sure they aren't fiddling around with their stitches while their cone is off. If your cat has a severe dislike of wearing the plastic cone, speak with your veterinarian about whether or not they need it based on their post-op behavior. Some cats don't bother their suture site much, while others pick at the stitches. 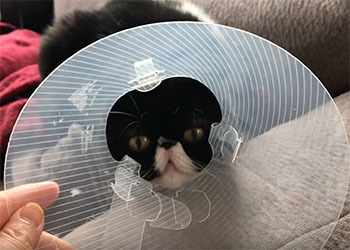 If you have a cat that gets too stressed wearing a traditional plastic cone, talk to your vet and maybe you can try a soft fabric style cone or an inflatable donut-style collar. 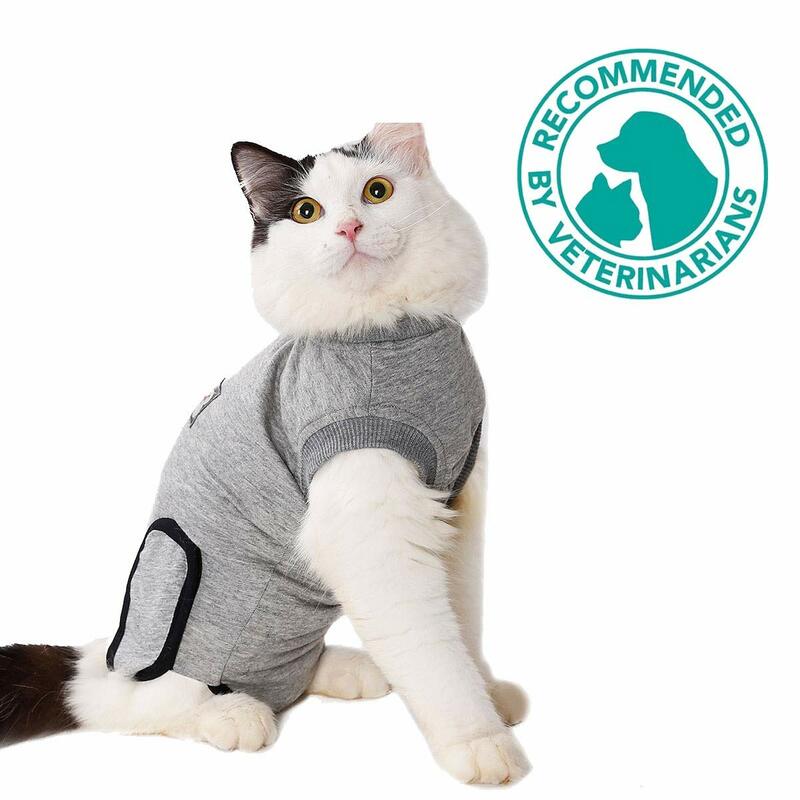 Some cat owners use a recovery suit or a small baby onesie to keep the stitches covered! 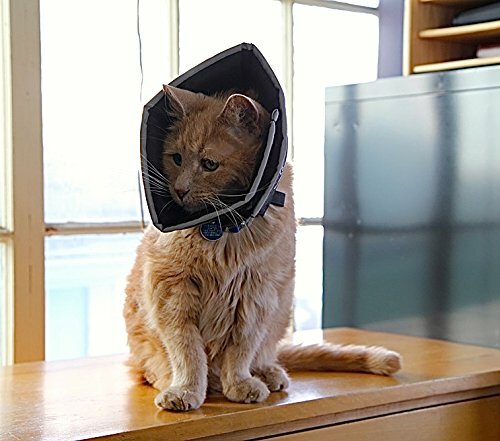 With a little bit of introduction to the cone and lots of positive association, your cat will likely be less stressed and not mind wearing that lovely lampshade while they recover. Let us know how your cat does wearing their cone in the comments below or share your cute "cat in cone" pics with us by sending them to connect(at)PreventiveVet.com.